“Coming Out Of The Dark” written by Pat Suzie Tennent is Pat’s personal story of recovery from a lifetime of abuse. Pat Suzie Tennent has written her memoir about her ongoing recovery from catastrophic abuse. She details her life with trauma induced PTSD and Dissociative Identity Disorder and the love that is helping her to heal from the past. As a child, Pat was abused by those who should have protected her. As a defence against this she developed DID which shielded her from the worst memories. As life progressed she began to heal from the trauma and develop communication between her personalities. Her story is not the story of how a child was abused. It is the story of how an adult can come to terms with the past and how love and compassion work recovery miracles. 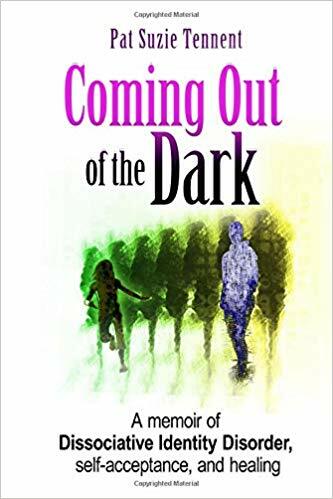 “Coming Out Of The Dark” is available as eBook and paperback on all Amazon sites.